The Fed Chair Janet Yellen’s testimony to the U.S. Congress last week was the major event that the markets focused on. In her testimony, the chairwoman of the U.S. Federal Reserve reiterated the central bank’s stand on hiking interest rates and also acknowledged the risks of raising interest rates slowly, which could see the markets fall behind the curve. The Fed maintains the view of three rate hikes this year and the first rate hike for 2017 could be expected either in March of June this year. The U.S. dollar gained on the news, but soon fell sharply on the day as investors booked profit while also expressing uncertainty conintuing President Trump’s policies. By Friday, the U.S. dollar was seen attempting to regain some of the losses. Economic data from the U.S. last week showed that consumer prices continued to rise strongly with the headline CPI seen rising 2.5% on a year over year basis in January, pushing consumer prices way past the Fed’s 2% target rate. Even the core inflation rate which strips the volatile food and energy components rose 2.3% indicating stronger inflationary pressures. Outside the U.S. data from the UK showed the pace of rising inflation was slower than expected. Headline consumer prices rose just 1.8%, shy of the forecasts of 1.9%. Later, wages data during the week showed a slower pace of increase in the average earnings which rose only 2.5%, down from 2.8% previously and Friday’s retail sales showed a 0.3% decline, falling below forecasts of a 1.0% increase. The British pound which managed to post some gains early on was seen weaker by Friday’s close. EURUSD is continuing to baffle traders with prices staying volatile. While last week’s price action gave some hints of further upside in prices, by Friday, most of the gains were given up. However, we continue to maintain that EURUSD could be seen pushing higher. 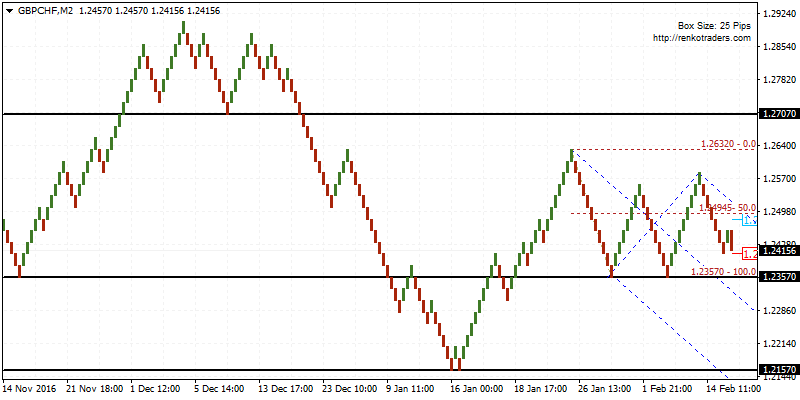 For the moment, price action is trading sideways within 1.0643 and 1.0568. Look for a higher low to be formed at 1.0568 for a possible upside target towards 1.0793. A safer trade would be to wait for EURUSD to breakout above 1.0643 to confirm the upside. To the downside, in the event that EURUSD breaks down below 1.0568, then further declines could be seen pushing the single currency lower towards 1.0468. GBPCHF: GBPCHF is turning increasingly bearish with price likely to approach the support near 1.2357. A break down below this support could see GBPCHF post strong declines towards 1.2157. However, apply caution as there is a potential for price to bounce off the 1.2357 support. In this case, wait for a breakout from the falling pitchfork and preferably wait for a breakout above 1.2494 to confirm the upside bias. In this case, GBPCHF could be targeting 1.2632 initially followed by an upside continuation towards 1.2707. USDCHF: USDCHF is sitting at the crossroads, with the risks evenly biased, making it quite difficult and in a way casting doubt on the direction fr EURUSD as well. The chart below shows a breakout from the falling pitchfork followed by a retest back to 0.9994 – 0.9974 support level. 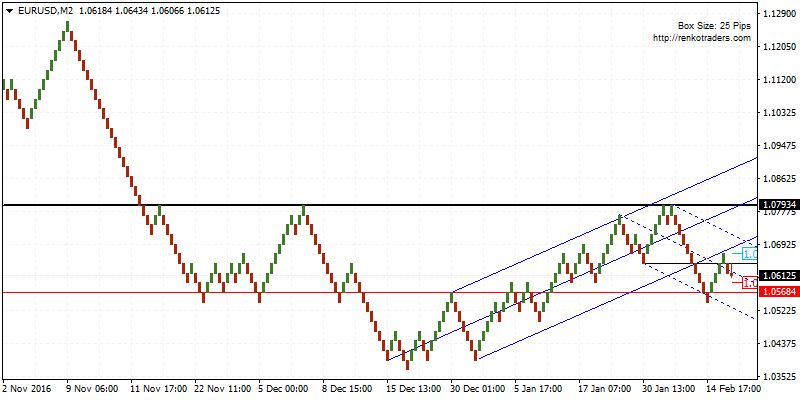 In the process, a minor rising median line was also formed from which USDCHF broke down. 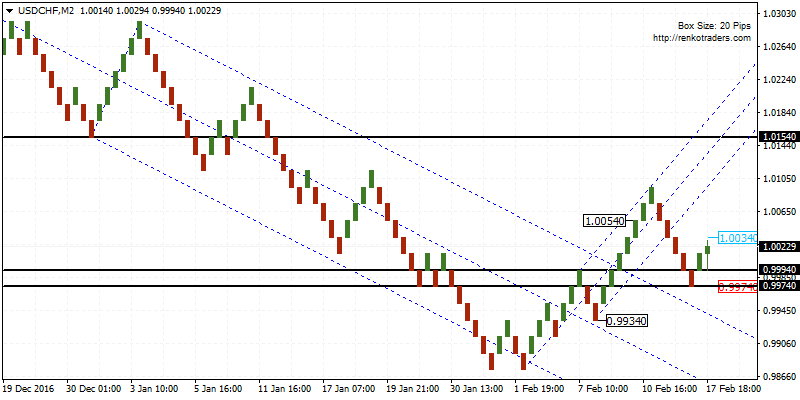 The question is whether USDCHF will rally to the upside or will push lower. To the upside, price will need to rise above 1.0054 in order to confirm the upside, while a breakdown below 0.9974 is needed to confirm the downside, in which case, USDCHF could be seen testing 0.9934. 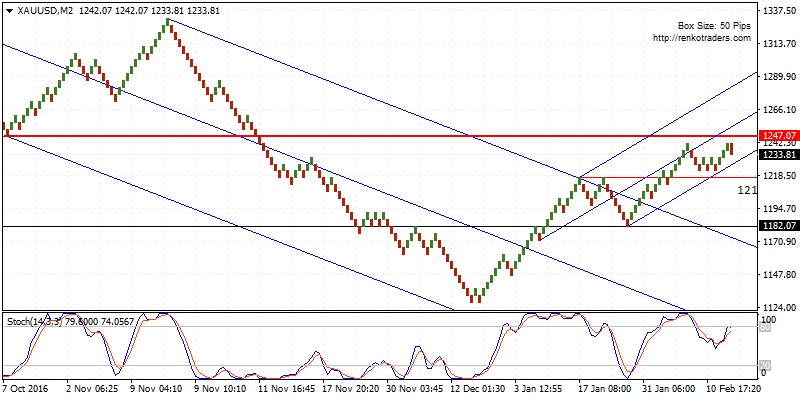 XAUUSD: Gold prices were looking bullish but Friday’s price action was seen closing on a bearish note. This comes on the double top pattern that was formed near 1242.07 and the bearish divergence on the Stochastics. A downside continuation could signal further declines in Gold as price action will first target 1217.07 followed by a stronger decline towards 1182.07. To the upside, there is scope for gold prices to test 1247.07, which will mark a retest of a previously held support level to be established as resistance. Looking ahead, it is a slow week from the U.S. as the markets are closed on Monday due to Presidents day holiday. Outside the U.S. markets are expected to be quiet, reflecting a rather slow week of second tier data. Among this, the Reserve Bank of Australia and the U.S. Federal Reserve will be releasing the meeting minutes from the early February monetary policy meeting. The RBA’s minutes are unlikely to move the markets much but focus will be on the FOMC’s meeting minutes where investors will be looking for clues on the next interest rate hike. On the economic data, the Eurozone inflation report this week will confirm that consumer prices rose 1.8% in January and 0.9% on core inflation which strips the volatile food and energy prices. Flash manufacturing and services PMI will also be released during the week and is expected to show that growth continued to remain strong in the region.